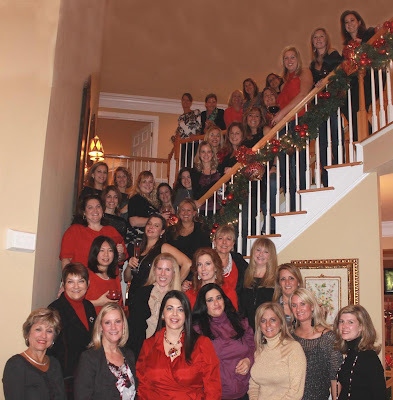 Holiday parties are so much fun! I love to see old and new friends during the holiday season. My friend Patti recently hosted her annual ornament exchange party. 35 lovely ladies brought a favorite $10 ornament to exchange at the party. Can you guess which gift is mine? Hint...it's in the front and is wrapped in two of my favorite colors. Patti's home was decorated in style for Christmas. I love her tree and all of her decorating choices. She's wearing a gorgeous red silk blouse with jeans, and I'm wearing a Kate Spade top with Babs wrap and black cigarette pants. Even though I had already had a little bit of dinner with the Twincesses, I indulged in many delicious treats. The baked brie, hummus, and homemade egg rolls were particularly delicious. Patti shared with me that she spent quite a bit of time polishing the silver to prepare for the party, but her hard work was worth it. Every detail was perfect. And of course I saved room for some sweets, too! Isn't the display pretty? The cakes were almost too pretty to eat, but once someone cut into them, everyone wanted a taste. The almond cake was my favorite. 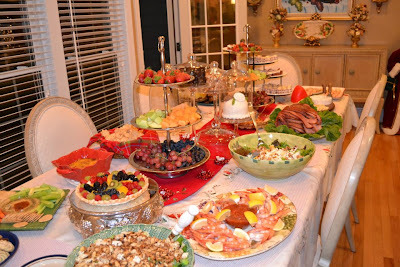 Ladies enjoyed champagne with berries, homemade sangria with lots of fruit, cosmos, and many other special drinks. Yummy! The ornament exchange was a lot of fun! Ladies planned and plotted to get their favorite ornaments during the exchange. One poor lady had her ornaments taken about 5 times and she had to keep choosing new gifts, but all ended well. She left the party with a lovely green kissing ball with a dangling crystal. Love! Here are the ornaments I received. The woman who brought them told me that they are vintage ornaments from Germany! What a great gift. I love the owl and the pinecone has a bit of pink in it. They're perfect. I brought a Lenox reindeer ornament I picked up at the outlet in Williamsburg. When Marta opened it, she quickly put it back in the box so that no one would "take" it from her! Too cute. Here's everyone from the party! What a great group! Many thanks to Patti for hosting such a delightful evening. She's such a gracious hostess. 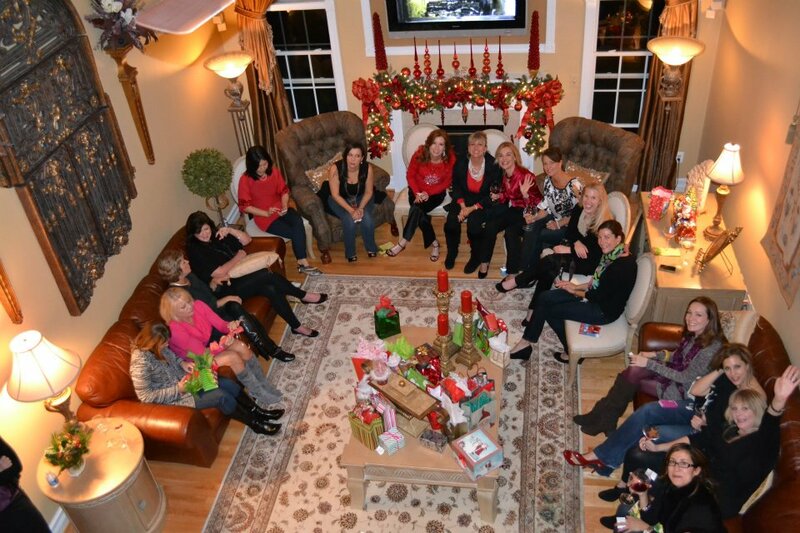 Have you ever been to an ornament exchange party? What was the favorite ornament at the exchange? P.S. Be sure to enter the giveaways in my 12 Days of Christmas celebration! Currently, you can enter two giveaways and and another fantastic giveaway is coming tomorrow. If you think the Lilly Pulitzer stocking from The Pink Pelican and the Vineyard Vines ornaments are fantastic, wait until you see what I have for you tomorrow!! I have never attended an ornament exchange party, but now I want to host one! i went to one last year. I was dying for these sparkly boots/shoes & purses from Nordstrom. I lost them but my gfriends ended up buying them for me later. Love Ornament Exchanges! Those sparkly shoes and purses were still a hot commodity at this year's exchange!! Two or three were part of the exchange and some were "taken." Have a great day! This sounds so much fun! I hosted a cookie swap last weekend, but maybe next year, I should add an ornament swap to the agenda! I attend an ornament exchange every year and please tell your friend Patti that her's is the most elegant and wonderful one I have ever seen. She really went all out and it showed. What a lovely and fun group you all are! Thanks for sharing...and please thank Patti for sharing her home with us. This looks like such a great idea. My friends and I will have to do this next year!